Knife Block Drawers and Knife Block Inserts, available to the customer’s specifications. Order the box with the insert, or the insert alone. Minimum drawer height is 3 1/2”. Minimum knife block depth is 16 3/4”. Order them prefinished or unfinished, and in most wood species. Cutlery not included. Spice Drawers feature stepped inserts designed for maximum fit and visibility of spice products. The inserts may be glued permanently in place, or shipped loose for additional flexibility. Order the box with the inserts or the inserts by themselves. The minimum drawer height is 4”. The standard drawer depth is 21”. Wine Drawer Inserts have scoop cut-outs to accommodate wine bottles. Inserts are 3” high. Neck scoops are 29/32”, and body scoops are 2”. Custom dimensions are always welcome. 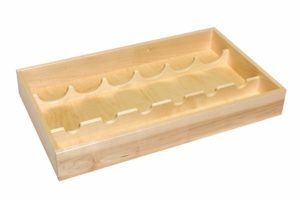 Inserts are available finished or unfinished and in most wood species.